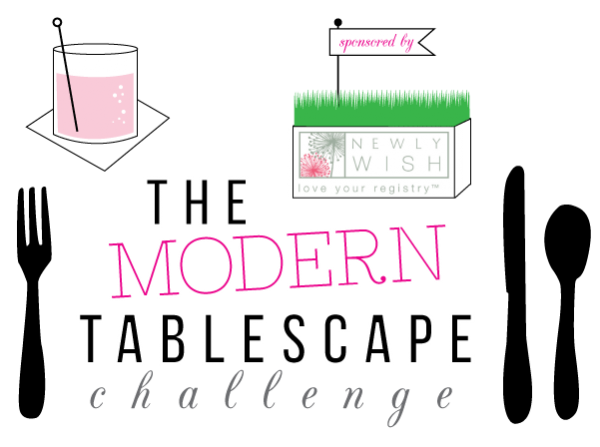 For our Modern Tablescape submission, we decided to put a Modern spin on a Bride and Groom’s Sweetheart Table, because we felt that these can easily end up looking tragically traditional. Cue the red roses and tapered candles! We were inspired by a recent meeting with a bride-to-be who described her dream wedding as a “non-wedding wedding.” She wants her big day to feel like a cool New York City loft party or a rooftop dinner party with a view of the city. 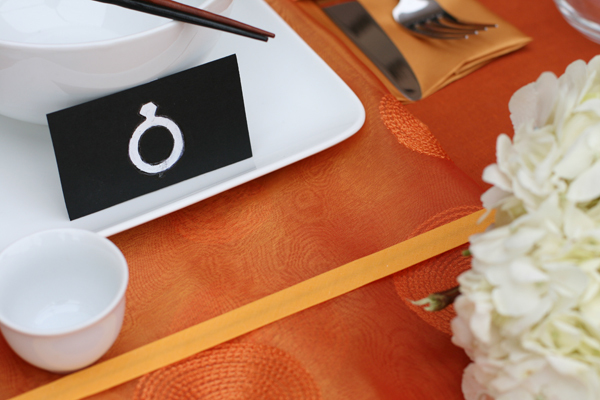 So we envisioned for her a chic sushi dinner party with low tables accented by clean lines, geometric shapes, and bold pops of color. The hydrangeas and hypercium berries add a sense of romance without overwhelming the table and are balanced by the wedding ring icons that denote Bride and Groom. 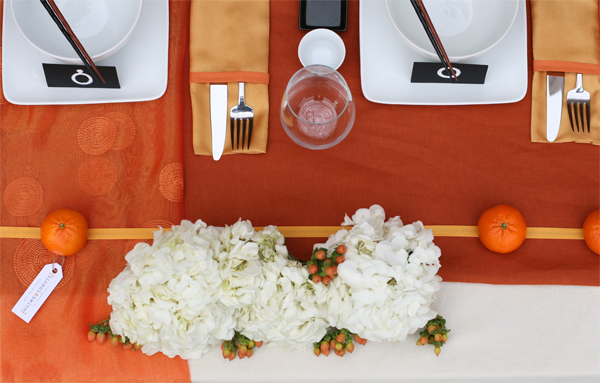 The table is pulled together by square edges and circular elements — down to a playful parade of oranges. The juxtaposition of sophisticated black and white elements also adds a sense of cohesion and makes the table feel elegant and modern. Love how clean, simple and MODERN this looks! beautiful! I love the subtleness, yet uniquely romantic nuances of this setting. 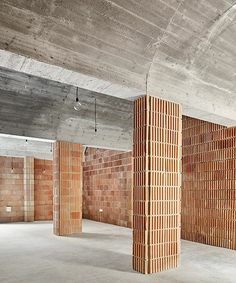 Difficult imagining any couple, regardless of age, not liking the clean uncluttered lines and the refreshing citrus tones. Very innovative! Love this!!! Freshly romantic and oh-so festive. Too often, elegance gets lost in pursuit of contemporary chic. This is *right on*. This looks amazing guys! Very classy and very “unwedding”…Love it! I love the idea of parading oranges. What table doesn’t need more fruit on parade? Stunning. So well thought out, down to the smallest detail like the mixed color chopsticks and the brilliant spin on the M/F symbols. And the little clementines! Well done, ladies. Wow, this looks fantastic, pulled together with elegance and subtle style, a fresh, understated wedding look that’d I love to see on my special day! It’s like a breath of fresh air. Clean, crisp and understated elegance. Love the color. This is a beautiful table! The color choice and shapes are perfect and truly modern. Wonderful design and execution. Absolutely beautiful! Clean and warm! Beautiful and so contemporary! I love the attention to detail especially on the bride and groom ring cards. I can’t wait to see more from Tinsel and Twine! Absolutely Gorgeous! I love the bright contrast of orange and black. The details are so innovative- love those black ring cards. Excellent work from this up and coming team of designers. Classic, simple and colorful. Love the little details! Whimsical Elegance is how I would describe Tinsel and Twine’s warmly romantic, sophisticated tablescape. What modern bride and groom wouldn’t be delighted to be seated at this sweetheart table? 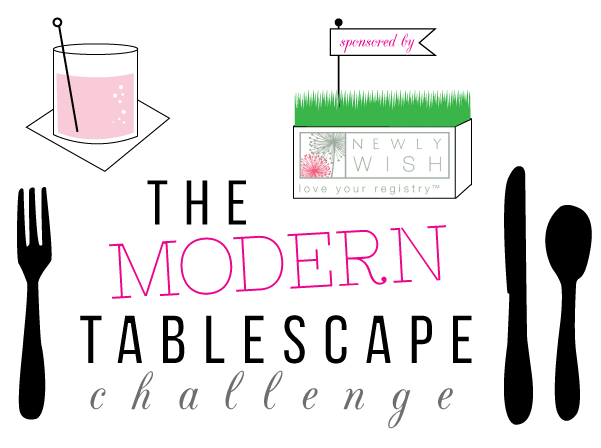 Who doesn’t think “if I could have done my wedding different I would have….” After reviewing the many design concepts posted, the Tinsel & Twine creation represents what is truly modern, Innovative, Simplistic, Function & Elegance. 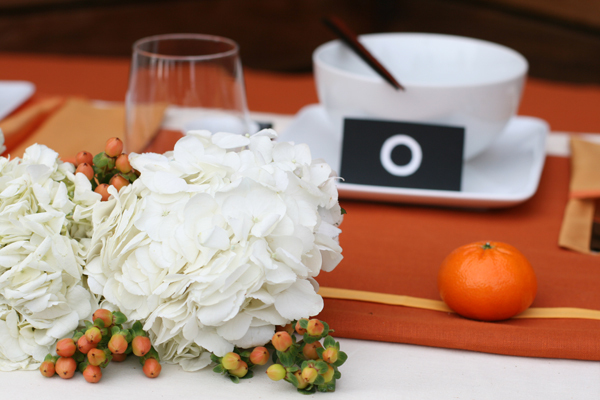 All the while NOT requiring the requiring guests to dispose/waste any of the decor in order to make the scene work. Every detail is just perfect: modern, clean and elegant. Excellent work! 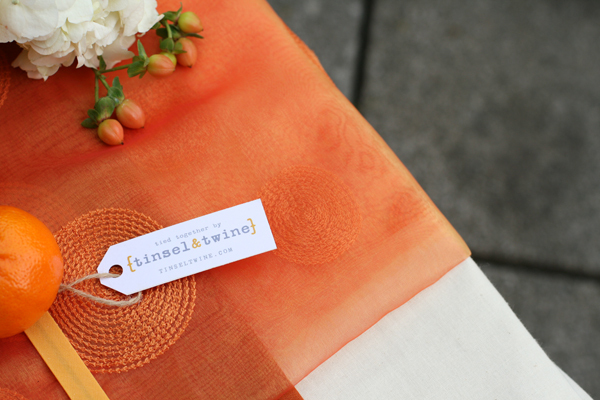 Would love to meet Tinsel & Twine for upcoming events! How lovely! The final touches “set” this table apart from the rest. Subtle, elegant, and fun! Creative, contemporary, complementary,composite, and complete. Well done. Crisp and sunny. Who wouldn’t feel uplifted and inspired in this setting! I think I have a new favorite color! Thanks Tinsel & Twine! The table was just beautiful! To me it says cool, modern and sophisticated, yet elegant, romantic and feminine. I love the use of the oranges. 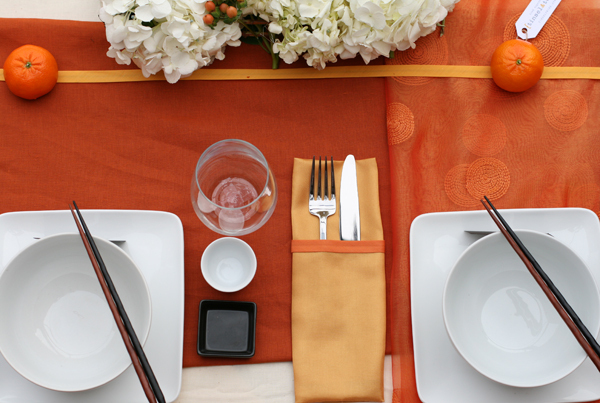 Not only do they add bold, fresh color, but traditionally oranges were meant to symbolize happiness and love (from what I’ve read) in Japan and China. The combination of items on the table brings together past and present in a way any modern bride can enjoy and be proud of. Bright and happy, warm and fuzzy. I LOVE the color combo, the adorable “parade” of oranges and how beautifully everything is arranged. LOVE THIS ONE! So beautiful, so fresh, so appealing, so unique. Just exquisite! 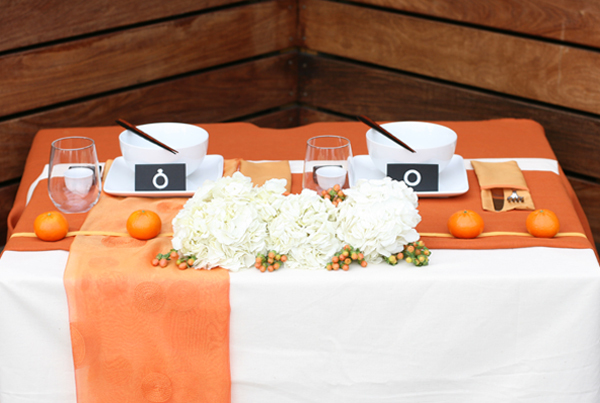 Who knew orange could be used so elegantly in a wedding? So proud of you all!